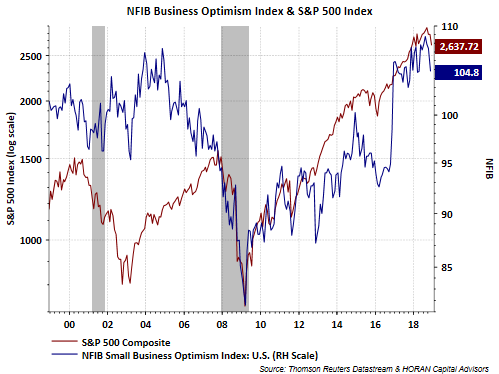 Although the November NFIB Small Business Optimism Index remains at a high level of 104.8, today's report is the third consecutive decline in the optimism index. The index high of 108.8 was reached in August of this year. "Sixty percent reported hiring or trying to hire (unchanged), but 53% (87% of those hiring or trying to hire) reported few or no qualified applicants for the positions they were trying to fill (unchanged). 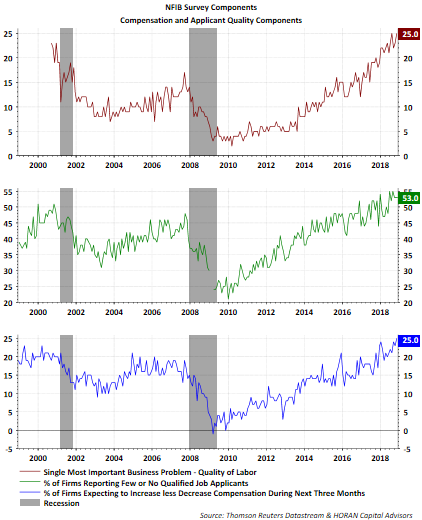 Twenty-five percent of owners cited the difficulty of finding qualified workers as their Single Most Important Business Problem (up 2 points), matching the record high reached in August".